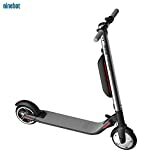 The Xiaomi Mi has been dominating the electric scooter market for a good while now. It’s been seen as a vital part of the evolution of the current scooter trend thanks to all of its impressive features, and revolutionary mechanisms. With a 250W motor behind your back, you will be able to go at max speeds reaching up to at least 15mph. 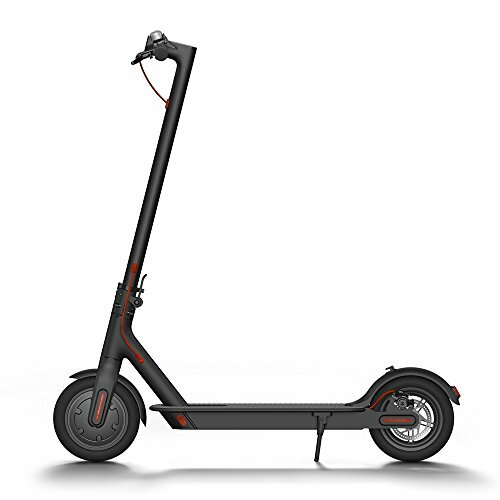 The scooter is 100% portable thanks to its folding body mechanism, it weighs just 25lbs, has an aerospace-grade aluminum frame, the high-capacity battery featured within is highly durable, it sports a double braking system, and doesn’t have a learning curve when it comes to hopping on and riding away. The Xiaomi Mi is featured with a 250W brushless DC motor that has a reliable, stable output. You won’t be getting jagged rides here, that’s for sure. Smooth rides are what the Mi is known for, and what it continues to be praised for. The motor will give your rides a significant boost, and much bigger enjoyment than cruising manually. Regardless, if you are on a long trip and do end up running out of battery mid-way, the Xiaomi Mi still doesn’t disappoint. It can be used as a regular, traditional kick-scooter when its batteries run out of charge. You can still achieve very high speeds on your own. However, to avoid unneeded physical activity and a sweaty appearance at work or at the market, it’s important to charge the scooter before going out. All in all, you can get in about 30km on a single charge with the Xiaomi on the eco-mode. On the regular-driving mode, the travel distance available equal to about 18-20km. This includes small obstacles such as inclines, rougher terrains, harsh surfaces and the general weight and speed of the rider. To ensure a steady and balanced riding experience, the Xiaomi Mi is equipped with a durable aviation aluminum frame. The most renown feature of the Mi is, of course, the foldability of this very frame. With three quick steps, you will have the Xiaomi ready to carry anywhere you need. When folded, the frame is well-balanced and easy to carry without trouble. Many happy customers praise the Xiaomi stating that when carried in its folded form, it doesn’t exceed the weight that you would carry with regular shopping bags. This is definitely an encouraging feature for anyone that has to travel a lot, whether it is for work or recreationally. An interesting and exciting feature of the Xiaomi Mi is the fact that its brakes work both when the scooter is charged, and when you are riding manually. This safety precaution is fantastic for anyone that wants to beat the last few miles, and support their ride manually while staying safe on the roads. You will be able to completely halt to a stop within 13.1ft, which is very reasonable for a scooter to reaches speeds of 15.5mph. The Xiaomi is equipped with two brakes that stop at the same time to help give you the safest stop possible, even at high speeds. The mechanical brake located near the disc will stop the back wheel, while the electronic brake will help pause the front wheel. With the E-ABC double disk and the anti-lock brake system present at the front wheel, you will be getting a fast, responsive stop. Anytime you feel like you are at risk, or need to pause your journey, you will be covered from all sides. The double brake system that we mentioned is featured both at the front and rear and helps drastically improve the quick yet safe stops whenever you need, too. The Xiaomi has a set of two 8.5-inch air filled tires which are perfect for riding over rougher surfaces, small obstacles along the road or road bumps in general. Cracks within the pavements shouldn’t be a problem, and even cobblestones can be handled relatively well by the Mi. Though it is recommended to stick to smooth avenues and clean pavements the majority of the time. All in all, however, these tires offer fantastic shock absorption qualities when needed, and small bumps and cobblestones won’t ruin your scooter by any means. Thanks to the anti-slip threads you also won’t be flying to meet the pavement when you are cruising down the smooth, clean avenues. With a speed of 15.5mph, this scooter is a keeper for many that have to make long commutes. If you need a fast companion to get you around your neighborhood/town/work/warehouse/company, then the Xiaomi Mi will allow you to do that within an admirable time frame. Since it speeds at least 5x faster than a regular walking speed, you will whizz by the pedestrians, too. Depending on the terrain, you can also exceed the initial 15mph stated on the packaging. Especially if going downhill, this speed can significantly improve the speeds. 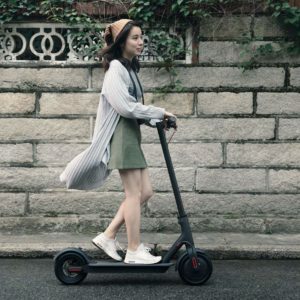 If you are tired of kicking away at your manual scooter and want something fast and effective to help you commute, the Xiaomi will keep you satisfied with its speed ranges. The Xiaomi Mi features a lithium-ion battery pack that can offer an admirable power of 500W, with a charge time of only 5 hrs. All in all, you can get in about 30km on a single charge with the Xiaomi on the eco-mode. On the regular-driving mode, the travel distance available equals to about 18-20km. This includes small obstacles such as inclines, rougher terrains, harsh surfaces and the general weight and speed of the rider. The battery system is very well arranged and logistically organized within the plastic deck of the scooter. Even with the batteries neatly stacked within the deck, the Xiaomi Mi remains incredibly slim and attractive with its design. Nothing bulky or out-of-place stands out, and the general appearance of the scooter is modern and inviting. No wires stick out within this fuss-free design. Manufacturers decided to step away from metal battery covers due to the fear of overheating. The battery management system that comes with this scooter thanks to the relevant app that it comes with it is also impressive. You will be able to constantly keep track of the status of all of the batteries included within the deck. Xiaomi made sure that you won’t be surprised when your scooter will start to near the end of its charge. The Mi is simply packed with features that help it exceed with its already well-assembled body. The headlights and brake lights help you stay safe and seen on the road. Many customers also report the lights being surprisingly bright and effective, just like any regular headlights they illuminate the road and are easy to be seen from a distance. Another feature is also the affordability of this scooter. For all the features that it offers the budget-friendly price is simply stunning. If you are looking for a commuting device that can help you get from one point to the other, replacing cars and public transport that pollute the environment, then this eco-friendly Mi will be a great addition to your daily routines. The Xiaomi Mi weighs about 25lbs, which makes it the ideal carrying weight when on the road. The assembled dimensions of the Mi equal to about 42.5 x 16.9 x 44.9 inches, while when folded you can see it being as small as 42.5 x 16.9 x 19.3 inches. to any teenager or adult that needs a fast commute. It’s also a great recreational scooter for when you want to go out and cruise around the park, or the neighborhood. It’s perfect for around-the-campus trips, and even more ideal as a traveler companion due to its compact folding feature. If you are looking for a device to help transport you without polluting the planet, the Xiaomi is the ideal candidate. It’s quiet, fast, and designed to fit almost any age group. The Mi is beloved by customers for many reasons, and we wholeheartedly agree with all of them. The compact, lightweight shape of the Xiaomi when carried is hard to rival. It’s slick, slim design is appealing and attractive, its headlights are powerful and help keep the road illuminated and the pedestrians warned. The sturdy aluminum frame helps keep you balanced on the deck, while the shock-absorbent wheels allow you to speed past small bumps and cracks that you encounter along your journey. All in all, the Xiaomi Mi is a powerful ride that is perfect for anyone that needs to travel & commute regularly and needs a reliable source of transport!